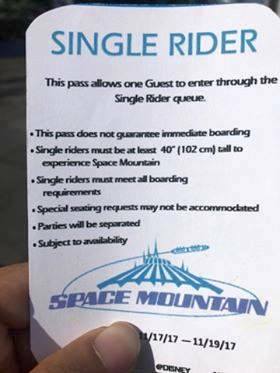 Disneyland tested out a Single Rider line for the popular Space Mountain attraction over the weekend. Disneyland Park currently offers Single Rider lines at Splash Mountain, the Matterhorn, and Indiana Jones Adventure. Over at Disney California Adventure, the Single Rider option is available at Grizzly River Run, California Screamin’, Goofy’s Sky School, and Radiator Springs Racers. If Disneyland makes the Single Rider line a permanent feature at Space Mountain, it will help speed things up for those who don’t mind a solo trip through space. Thanks to Malcolm for the info and images. 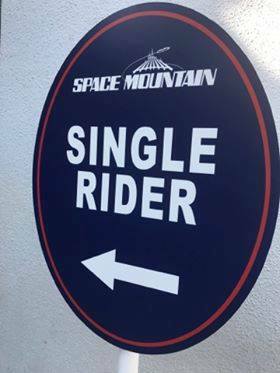 Did you have a chance to use the Single Rider option at Space Mountain over the weekend? Let us know in the comments.